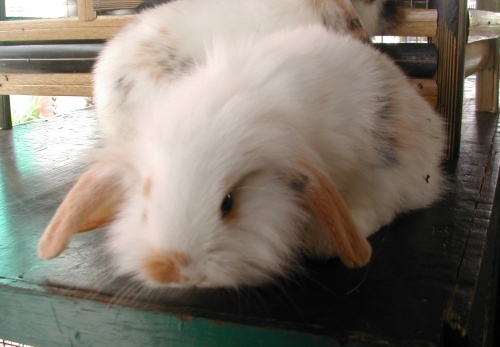 American Fuzzy Lop is just like Holland Lop, but with wooly long fur. The head, the body, the size – just a bit bigger – and even the personality is similar to Holland Lop. The different in visibility is just in the fur that wooly like Angora. Does it originated from Holland Lops that cross-bred with Angoras? People suspect so, and logically it is. However, there’s another theory – or thinking – that some Holland Lops naturally has wooly fur as anomaly. Breeding two Holland Lops were resulting the early AFL, and so on until the current “version” of AFL. I believe you easily guessed that AFL is a short for Americ.. Fuz.. Lop rabbit, the very long name. By the way, they yet have some other nicknames such as “The Fuzzy Lop”, “Fuzzy”, or just “AFL”. Their weights are between about 1.6 - 2 Kg, categorized as small rabbit. It is just a bit bigger than Holland Lop that categorized as dwarf rabbit. AFL: small Lop rabbit with Angora wool. Fuzzy has more variety of colors and patterns than Holland Lops, which are typically just brown, black or white. For examples the most popular fuzzy are agouti, broken, pointed white, self, shaded and solid. There are still much more colors and patterns of fuzzy.